Our Database Report is Finally Being Published! We’ve been working on our database of domestic “terrorism” prosecutions since about early 2009, and have been working on the Report over the past year and a half. It’s been slow, since it’s a completely volunteer effort. But I think it’s good quality work, combining legal experience with these cases, Steve Downs’ ability to see the big picture (I get lost in the details), lots of data analyzed , a great database written by Lynne Jackson, and superb editing and advice on how to make the report more professional from Jeanne Finley. First we compiled a lot of data on the 399 cases listed by the DOJ (and many other cases not listed there because they occurred before or after the time frame DOJ used, or for some other reason). We downloaded information on the case from the court websites, which include case number, co-defendants, charges, convictions, sentences, lawyers involved, a chronology of the filings in the case, and other information. We also looked at newspaper, magazine and blog articles on the case, DOJ press releases, prison location information and websites set up by supporters. We called all sting operations preemptive prosecution. A sting is a case where the defendant would not have committed the particular (fake) crime were it not for the involvement of a government provocateur. There are a great number of groups and individuals who could be targeted in a sting operation, but the government has chosen to target mainly Muslim men. Cases involving Muslim charities or charitable donations (generally involving charges of material support to terrorism) were considered preemptive prosecutions unless there is evidence that the defendants intended the money to support violence. Prosecutions based on what would normally be protected speech under the First Amendment were considered preemptive prosecutions even if the defendants advocated non-specific violence. Charges of making false statements to the FBI or immigration or other federal law enforcement authorities were considered preemptive prosecutions if the false statements were unconnected to any other violations and appeared to be simply devices to hold the defendant because of suspicions about his or her ideology. Interestingly, DOJ recently made two significant changes which are relevant here: 1) they are requiring that the target must know making a false statement is illegal before being charged; and 2) they are recording interrogations, which provides important context and limits the ability to charge people based on FBI lies. Immigration charges were considered preemptive prosecutions when there was no evidence of any terrorist activity or of any crime beyond a technical violation, such as an omission on a form. Many of these cases, often prosecuted soon after 9/11, were based on initial suspicions that were proven false, or for which there was no evidence. 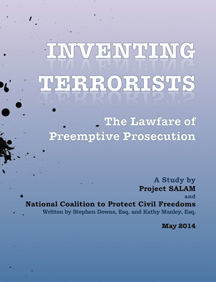 Based on the above criteria, among others, we discovered that 72.4 %of the 399 cases were preemptive prosecution, and 94.2% of those cases contained elements of preemptive prosecution, leaving only a small handful of defendants who could be termed actual (rather than perhaps potential) security threats. Considering how many times the government has touted their statistics (“we’ve convicted about 400 terrorists in US courts”) we think these statistics and our analysis is very significant. We realize that trying people in US federal courts may be better than throwing them into Guantanamo, but the reality is that the process isn’t really all that much fairer. Read our Report and see if you agree or disagree. We are well aware (see Dirty Wars here (link) for example) that this is really nothing new, but this Report is limited to 2001-2010 because that is the time period for the DOJ list. However our analysis was actually informed by this country’s long history of persecution against targeted groups, including but not limited to Native Americans, African-Americans (always and still, unfortunately), Chinese, Italians, Irish, Japanese, Catholics, Jews, anarchists, Communists, gays and lesbians, Latinos (and non-white immigrants generally), and now Muslims. CHICAGO, ILL: Without a doubt, the highligt of the event was the rally at Trinity United Church of Christ on West 95th Street in Chicago where Angela Davis spoke. First, I attended the dinner which honored Charlene Mitchell and Angela Davis. Ms. Mitchell was one of the organizers of the Free Angela Davis campaign, and has worked tirelessly for civil rights. She was the first African-American woman to run for president of the United States in 1968. 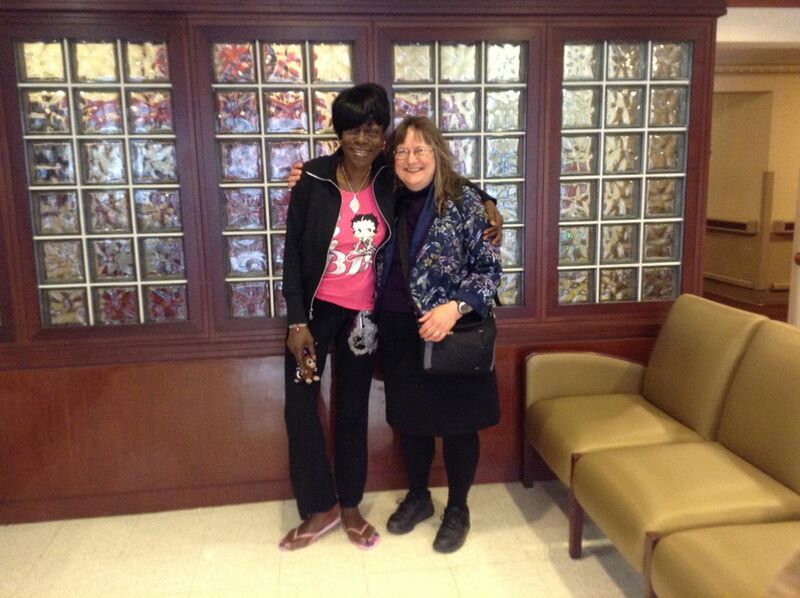 Though Ms. Mitchell did not speak at the event, her presence was a powerful reminder of past struggles for justice. Ms. Mitchell organized her first activism at the age of 13, and worked on many issues including ending apartheid in South Africa. An amazing and powerful woman, from whom we could all learn a lot. The Rally was held at Trinity United Church of Christ, also known as “Obama’s Church” e.g., the church President Obama attended when he lived in Chicago. Mr. Obama was vilified in the press because of the church pastor, the Rev. Jeremiah Wright who supposedly espoused “radical” beliefs. Though Rev. Wright did not attend the rally, several pastors of the church spoke. Two of the pastors, Rev. Rochelle Michael and Rev. Otis Moss III, offered beautiful, moving prayers which spoke to the heart of the problem of injustice in America. The prayers were poems, observing the injustice in the world and how we can work together to change the world for the better. No wonder the right-wing media had a melt-down over what Rev. Wright said – if his words were as powerful as the words of the current pastors, the right-wing media does not want to hear about people rising up and creating justice in the world for everyone. I was thrilled to be in such a beautiful church where such beautiful words of wisdom and justice were spoken. Bill Hampton spoke about his brother, Fred Hampton, who was murdered in the middle of the night in his bed by the Chicago police. Fred Hampton was murdered in 1969 – 45 years ago at the age of 21. His memory is very much alive – Mr. Hampton spoke about his brother, and the continuing struggle against police murders. Mr. Hampton asked that his mother stand to be recognized. He spoke of Angela Davis as a tall sister with a tall system. Mr. Hampton said that Angela Davis still had the fire burning, and that after she was found not-guilty and freed, she has continued to work to free political prisoners. Frank Chapman introduced Angela Davis. Frank began by saying that he remembered the exact date the National Alliance Against Racist and Political Repression – May 17, 1973. Why he knew the date is of much more interest. Mr. Chapman stated that he was convicted of a murder he did not commit in 1961 and was given a sentence of life plus fifty years. In 1973, his lawyer wrote to him and told him the NAARP had formed and that they were going to get him out of prison. In 1976, he came home to St. Louis and met Angela Davis. Angela Davis came to the podium as the audience gave her a standing ovation. She is tall, and has a striking afro hair-style that makes her stand out. Her words were inspiring. Ms. Davis began by saying she felt as if she had come to a 40-year reunion of the NAARPR and standing up to resist police violence. Then, she began her presentation with a history lesson. She said the most radial decade in US history were 1865 to 1876. At that time, leadership came from former slaves. It was the withdrawal of federal troops from the south that gave rise to the Ku Klux Klan. When she was young, the police was controlled by the Klan. Domestic terrorism were inflicted by the police and the Klan. She emphasized that if we are only upset about individuals who perpetuate police violence, and not the structure of that violence, that we will never get to the root of the problem. Ms. Davis believes that we are witnessing an epidemic of police violence and vigilantism. 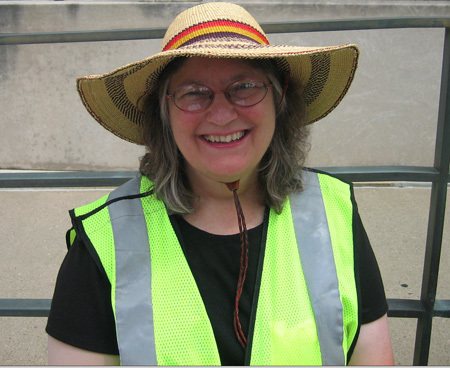 She observed that there are 300 million guns in the US – enough for one for nearly every person in the US. She advocates gun control, and brought down the house when she said that we should remove guns from the police, the FBI, ICE and the military. Why are so many black and Latino people arrested and incarcerated? Because it is these communities who are subject to extensive surveillance. Racist violence – genicidal violence is embedded in our culture – beginning with the genocidal violence perpetuated against native peoples. Ms. Davis told us to remember that we were meeting at that moment on occupied land. We must think beyond individuaism. Racism is embedded into our institutions. Prison, she said is “civil death” and mass incarceration is fueled by racism. We must think beyond the individual, and change the institutions of racism. Ms. Davis received a standing ovation. Everyone wanted to talk to her, to touch her. For all her power speech, she seemed quite modest, as if to say, we are all in this together, and that she, herself, is nothing special, just another . The rally ended with a beautiful prayer by Rev. Otis Moss, the Pastor of Trinity United Church of Christ. The Forum organizers were careful to point out that it is police crime to be addressed, not police brutality. The distinction is that these events are not just brutal, but crimes committed by law enforcement against civilians. And, that these crimes should be prosecuted as crimes. Build support for a Citizens Police Accountability Council, including building support from labor unions and community groups. An all-out effort to support Rasmea Odeh, and to attend her trial beginning June 10 in Detroit. Stop the arrests of children in schools. In the “good old days”, bad behavior from children in school may have resulted in standing in the corner. Today, with the presences of police in the schools, a child may be arrested instead. This must stop. Implement the use of cameras for police to both wear, and for cameras that can document events happening in police cars. Allow only tazers to be used, no guns. The Forum Program book listed many victims of police crime. The reading of this list brought home to me how real people suffer at the hands of police crime. Each story was more shocking and sad than the next. The mother of one victim told the story of how her son, Stephon Watts, was shot by the police in front of her in her own home. A brief description of Mark Clements‘ story (a victim of Jon Burge’s torture) was read. Unfortunately, the list of victims of police crimes was long. Many presenters explained that though these crimes are perpetuated by individual police, that the crimes are a result of institutionalized brutality. That though individual police may (rarely) be prosecuted, that police crime is a result of the structure of the system. I was pleased that so much support was shown for Rasmea Odeh. She is listed in our Project SALAM database of preemptive prosecution defendants. Though the name of the conference was “National Forum on Police Crimes”, the FBI was clearly included in the definition of “police”. Though people attending the forum mostly represented groups targeted by the police including people of color, labor, immigrants, women, the LGBTQ community, peace and solidarity movements, and political prisoners, everyone there recognized the targeting of the Arab and Muslim communities. The National Alliance Against Racist and Political Repression is 41 years old. The history of the struggle against racism and political repression is long. Some of the leaders of this Forum were founders of the NAARPR, and knew police crimes first hand. I felt inspired by the people who spoke, and feel inspired to keep fighting against the targeting of people because of their color and/or political beliefs. We are all in this together. The last evening of the Forum ended with a rally at which Angela Davis spoke. The rally was the highlight of the Forum, and I hope to write about the rally in the next day or two. 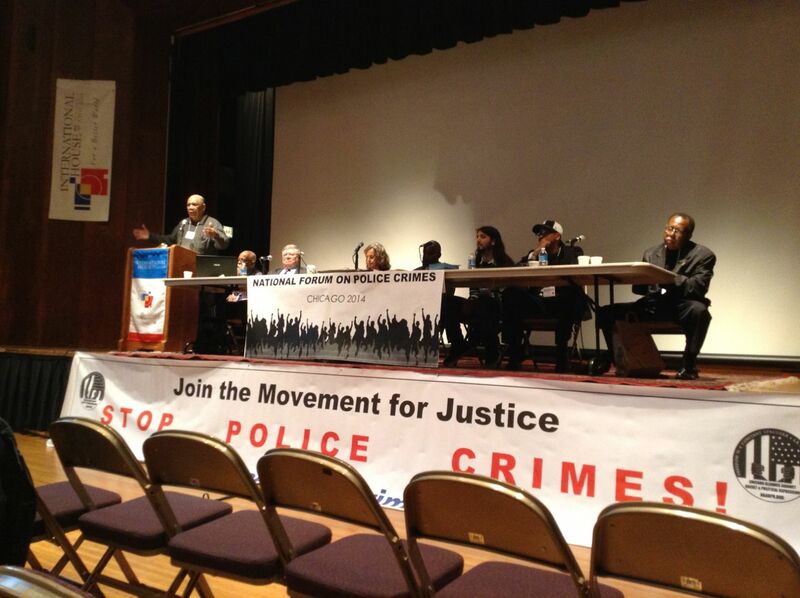 CHICAGO, ILL: The National Forum on Police Crimes was held in the International House of the University in Chicago in May, 2014. 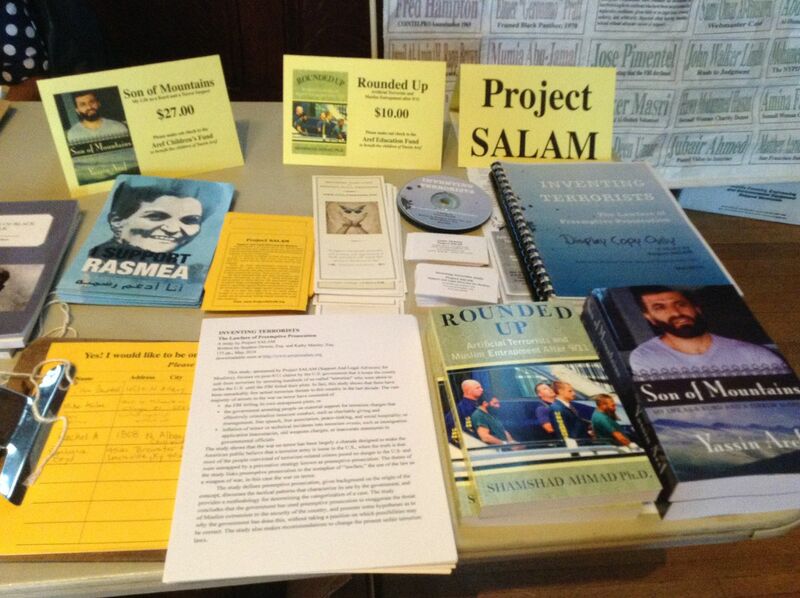 I was privileged to attend on behalf of Project SALAM – Support and Legal Advocacy for Muslims. Frank Chapman opened the conference by outlining the extent of the issue of police crime, emphasizing that police crimes are not just a local issue, but a national issue. Lennox Hinds moderated the conference. All of the speakers were powerful in their description of police crimes, noting the number of people shot by police in Chicago (120 killed by police in Chicago in 2012), to the targeting of people because of their race, religion, sexual orientation or gender. The John Burge torture scandal was often referenced. Burge was the former Chicago Police Department detective and commander who gained notoriety for torturing more than 200 suspects between 1972 and 1991 in order to force confessions. One speaker referred to Chicago as the “false confession capital of the world.”. Jeff Baker, a candidate of Chicago City Council, spoke about a proposed “Civilian Police Accountability Council” (CPAC), which calls for an elected civilian board to control the police, which would, among other items, appoint the police chief. Though this particular legislation is proposed for Chicago, Mr. Baker urged people to have this legislation passed through out cities and towns in the US. Muhammad Sankari of the Arab-American Action Network spoke about the targeting of Muslims, and outlined a particular case – that of Rasmea Odeh, a leader of Chicago’s Muslim and Arab communities. Clearly targeted for her beliefs and her activism, she goes on trial on June 10 in Detroit, Michigan. Rasmea is facing 10 years in prison, revocation of her citizenship and then deportation. 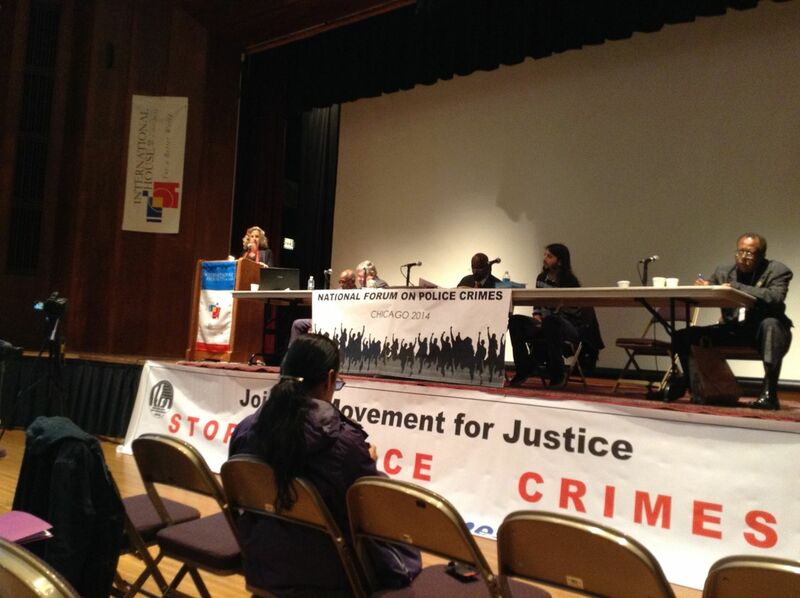 Bernadine Dohrn explained more about the racial disparity of people in prison – its “OK for white kids to have marijuana, but not black kids.” How over-charging of crimes leads to plea deals, and that there are 10,000 people in the Cook County jail, which is located just two miles from the Forum. Ms. Dohrn described the long history of police crimes in Chicago, from the police beating of protesters during the 1968 Democratic Convention, to the assassination of Fred Hampton, to the John Burge torture scandal. There have been successes, however, including elimination of the death penalty for juveniles, the closing of two juvenile prisons and of the infamous TAMS prison, among others. Crista Noel spoke about how she brought the issue of Chicago police shootings to the UN Human Rights Committee. The issue of Chicago police brutality was included in the UN Human Rights Committee Report. Ms. Noel went to Geneva to testify at the UN. After the first panel discussion, where the issue of police crimes was described in detail and some solutions offered, we broke out into workshops. I attended the workshop entitled “The National Movement to Stop Police Crimes Against Peace and Solidarity Movements,” facilitated by Muhammad Sankari and Joe Iosbaker. We had a very lively discussion and learned more about the campaign to support Rasmea Odeh during her up-coming trial. During the workshop, one of the youngest participants raised the issue of fear of being targeted for her activism. 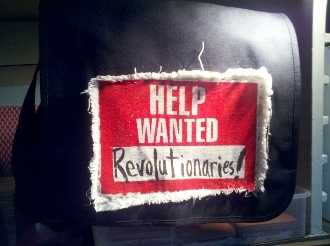 And, of how can an activist support herself financially, while at the same time, work on these issues. For example, the first day of the Forum was held on a Friday. Many people work during the day, and have a difficult time taking time off during the day to attend. Also, the issue of supporting Rasmea Odeh during her possibly two to three week trial. Young people working one and two jobs are not able to take off this amount of time to work on justice issues. Joe Iosbaker described his experience of having his house raided by the FBI, and how 25 FBI agents spent twelve hours in his house. He and his wife, Stephanie Weiner, were two of the twenty-three peace activists whose homes were raided by the FBI in September, 2010, and were subpoenaed to appear before a grand jury. All of the peace activists refused to appear before the grand jury. A national campaign was organized to support the peace activists. Our workshop resulted in offering two recommendations to the Forum: 1) to support Rasmea Odeh and 2) to stop the targeting of people for their political and religious beliefs. After the Forum ended for the day, I had time to speak informally with people attending the conference. I was very pleased to see Gregory Koger again, in person, in good spirits and out of jail. Mr. Koger had suffered an unjust prosecution by the Ethical Humanist Society of Chicago in a case that was so crazy, it hard to believe. But, its true! Mr. Koger was arrested for taking a video of Sunsara Taylor speaking at the Ethical Humanist Society of Chicago. The legal battle lasted for four long years, and ultimately, Mr. Koger spent nearly a year in jail. For taking a video. I also met Stephanie Weiner from the Revolutionary Lemonade Stand, and one of the 23 peace activists whose home was raided. 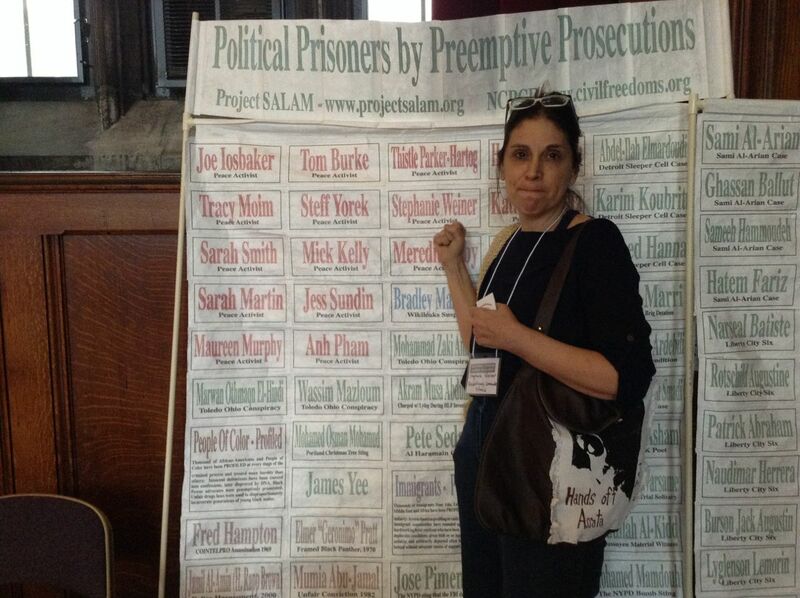 Below is a photo of her pointing to her name on the Project SALAM wall of names. The conference was two days – I will write about the next day soon. 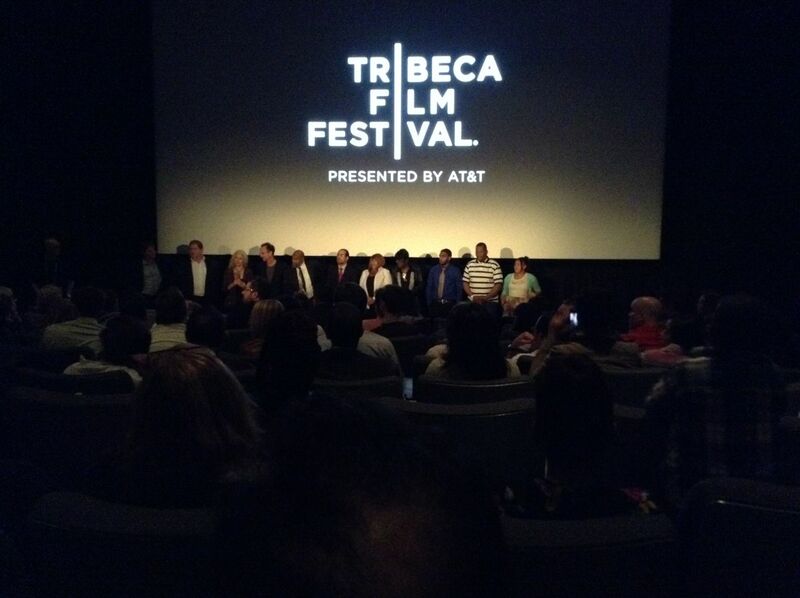 The Newburgh Sting at Tribeca Film Festival! The Newburgh Sting was shown at the Tribeca Film Festival a few days ago (April 22, 21014) and I was excited to see the movie.The film opens with dramatic footage of surreal aerial surveillance. A van is followed and kept in the cross-hairs as it starts and stops and drives around. Such high-tech other-worldly surveillance emphasizes the importance placed on this case. TV news clips are shown. Terrorsts! Arrested!! In a huge raid!!! Important politicians – Mayor Blumberg, Police Commissioner Kelly, Senator Schumer – are interviewed. Terrorists! Danger! The FBI caught the bad guys! News video show the arrested men looked ashamed, heads downs as they are paraded before the public. Terror plot! FBI foils plot! America is Safe! The story begins to unfold. 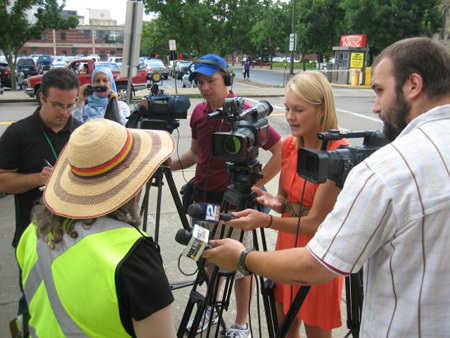 A TV reporter asks questions of politicians – who eventually admit that no one was ever in danger from this plot, all the bombs and the stinger missile used in the plot were fake and made or provided by the FBI, the attack was invented by the FBI, and that the defendants had been followed around by the FBI for a year. After the dramatic beginning which appears to show the FBI thwarting this horrific plot to blow up a Jewish Community Center in Riverdale and shoot down planes on an air force base, the rest of the story is told in interviews of family and friends of the accused, their lawyers, and experts such as a retired FBI agent and the Imam of the mosque in Newburgh. Interspersing the FBI surveillance videos with interviews of people who knew the arrested men, the story slowly comes out – these men were played for fools by the FBI and entrapped in a plot that was scripted like a movie. These impoverished men, not one of them having a passport, car or even a driver’s license, were not capable of carrying out such a plot. As Alicia McWilliams, aunt of David Williams (one of the defendants), often said – these men could not organize a barbeque, let alone a terror plot. The FBI surveillance videos are primarily filmed at the house the informant rented in Newburgh, NY and his car. Some surveillance videos were of a warehouse in CT where the informant kept the stinger missile. In one video clip, David Williams (one of the defendants) was sitting in the back seat of the informant’s expensive car. The informant, Shahed Hussain, is explaining to David how the missile will be used to shoot airplanes at Stuart Air Force Base. David expresses concern about people getting hurt, saying that people could be cleaning the planes, and he did not want anyone to get hurt. I was most interested in the videos of the informant himself, Shahed Hussain, as he was the informant in the case of Yassin Aref and Mohammed Hossain, two muslim men entrapped in Albany, NY a few years prior to the Newburgh Sting. I attended some of the court sessions of the trial of the four men entrapped in the Newburgh Sting and saw Shahed Hussain on the stand. I found him very difficult to understand, due to his heavy accent and soft voice. I was quite surprised in the FBI surveillance tapes in the film, because in the movie, Shahed Hussain speaks perfect English. Yes, he has a slight accent, but, everything he said was perfectly understandable, unlike when I attended court. I am left wondering why he was so hard to understand in court and so easy to understand in the movie. Also, the video I saw when I attended some court sessions was grainy and blurry and the audio was unintelligible. In the movie, all the FBI video surveillance was crystal clear and the audio was perfect. Made me wonder why. Alicia gave an excellent interview in the movie. Extensive clips of her interview were used in the movie. Alicia summed up the case quite well, saying how can the government do this to us? How can our government entrap people? Also intereviewed was David Williams’ mother; a friend of Onte Williams; Leguerre Payen’s lawyer, Sam Braverman; and the Imam and assistant Imam of the mosque in Newburgh. Both of the religious leaders gave powerful comments on the case. The movie starts out with an OMG how can these guys want to blow stuff up to OMG how could our government entrap these men to fit a movie script? The men who were arrested are never interviewed. During the Q&A after the film, the film maker stated that he tried very hard to get permission to interview the men. He even had a letter from ABC requesting permission to interview them. Not even with this type of media backing could get the filmmaker inside the prison walls to hear directly from the men. It makes one wonder why it is so important to keep the defendants’ stories hidden. Attending this film showing at Tribeca was great. 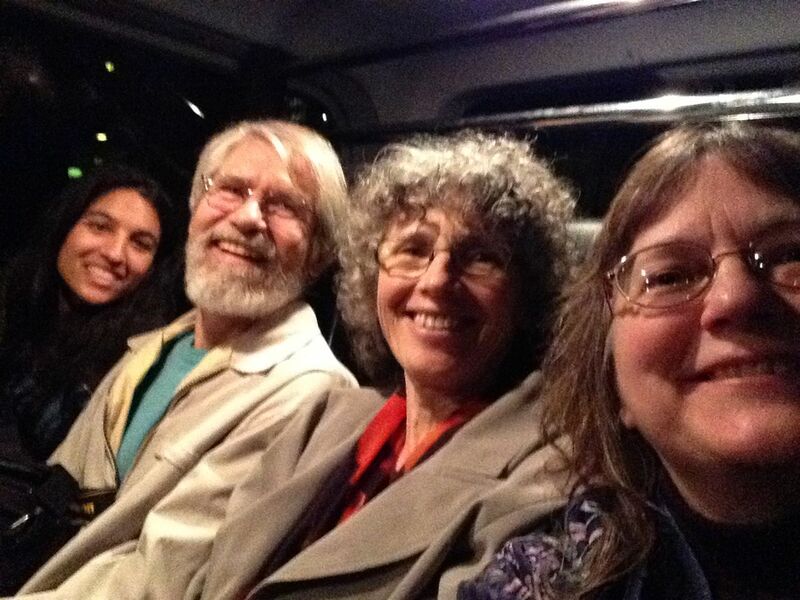 My friend, Ayesha and I went to dinner, then arrived at the movie theater about an hour early, where we met up with Alicia McWilliams (David Williams’ aunt). Alicia introduced us to David Heibroner and Kate Davis who made the movie. We got to see the pre-movie photos that were taken. 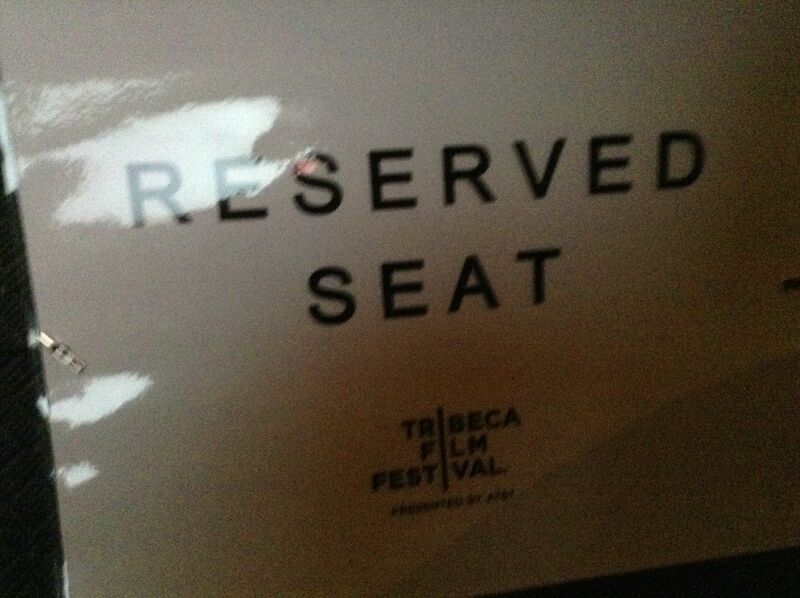 We sat with Alicia in reserved seats to watch the movie. After the movie was a question and answer. Alicia gave an brief excellent speech summarizing the case. We were driven in a van to the after party, where we were treated to excellent food and wine. The entire experience was surreal. After all of these years, going to protests with Alicia, presentations with Alicia, talking about the Newburgh Four case, the Newburgh Sting is now a major movie. Perhaps now more people will take an interest in the wrongful targeting of Muslims in this country. The movie will be shown on HBO on July 21, 2014. 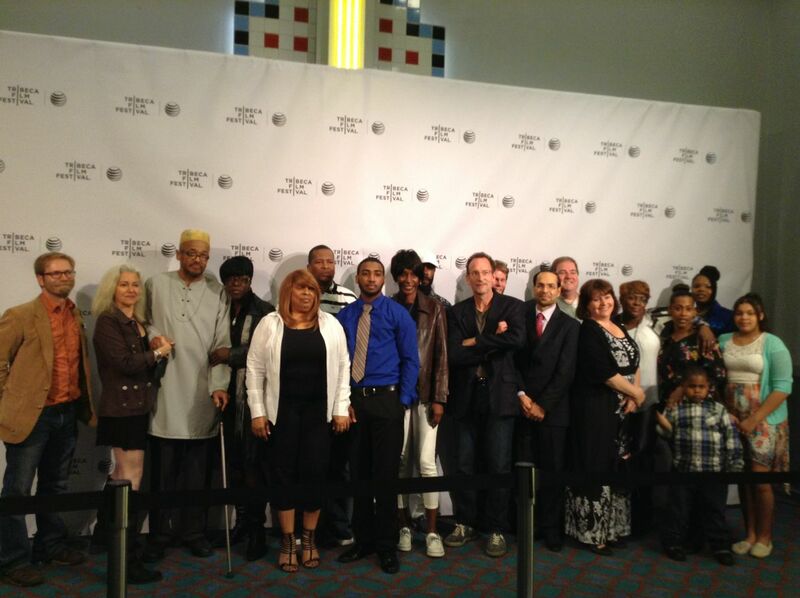 This photo includes most of the people who were interviewed in the movie. Alicia McWilliams is forth from left. 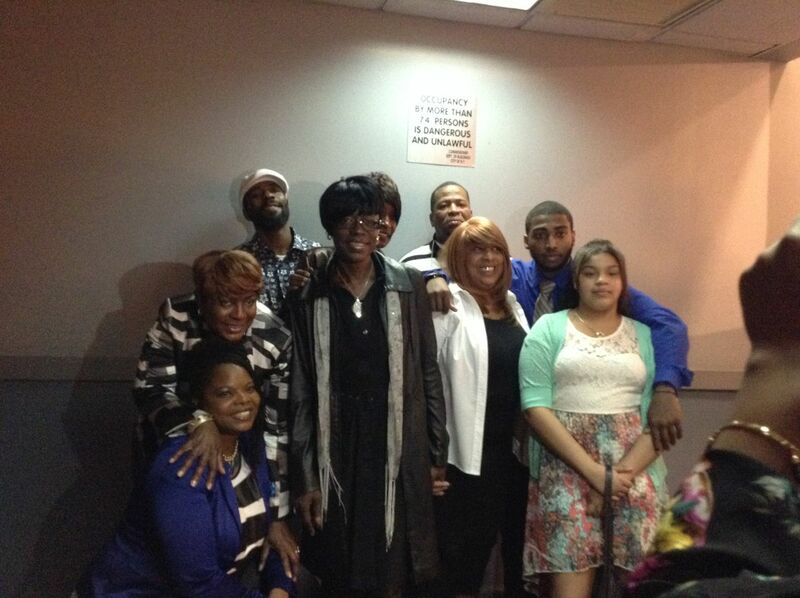 Alicia McWilliams surrounded by her family. David Williams’ mother, Lizzy McWilliams is white jacket. I had a reserved seat! The defense attorneys have filed a new motion in Yassin Aref’s case. We will hold a press conference about the new motion on Tuesday, December 3 at 11:00 AM at 280 Central Avenue, Albany, New York. This reply motion notes that Attorney General Eric Holder announced on November 15 that the DOJ will notify defendants––including those in past cases––if evidence derived from NSA surveillance was used in their cases. The New York Times reported on January 17, 2006 that warrantless NSA surveillance was used in Aref’s case, but over the years Aref and his attorneys have not been able to obtain any more information about it, since the information was classified. A still-controversial part of Aref’s 2006 trial featured the government’s use of secret evidence, which to date has never been seen by the defense, the jury, or Aref himself. Defense attorneys believe that this secret evidence included NSA surveillance. Aref’s attorneys expect DOJ to notify Aref that NSA evidence was used in his case, but Aref also has good reason to believe that the information derived from this NSA evidence is false. Aref’s 2255 appeal highlights new evidence that shows that as early as December 2002, the FBI thought he was an Al Qaeda agent named Mohammed Yasin. But an Al Qaeda agent named Mohammed Yasin was killed in Gaza in 2010, and thus could not have been Aref. Aref’s attorneys believe that the government falsely and secretly told both the trial court in Albany and the 2nd Circuit Court of Appeals in New York City that Aref was part of Al Qaeda, and that this false information ensured both his conviction and denial of his original appeal in 2008. Read the entire reply motion here. Everyone is invited to attend the press conference which will explain the defense motion in detail. I will give a presentation on the Journey for Justice at the Save the Pine Bush vegetarian/vegan lasagna dinner on Wednesday, September 18 at 6:00 PM. My presentation will begin at 7:00. People are welcome to attend the presentation only at no charge. Everyone who is interested in the Journey for Justice, how the idea came about, our boating mis-adventures in the Susquahanna River, and how I started out walking and wound up traveling the last two blocks in a wheelchair is welcome to attend. I will speak about Yassin Aref’ and Mohammed Hossain’s case. I will talk about the many wonderful people I met along the way, the challenges of walking in our beautiful country, and how I learned that people really care about justice. I hope to see you all on Wednesday, September 18! PS – If you want to come for dinner, please call Rezsin Adams at 518-462-0891 to let her know you are coming so she can make enough food! Or, email pinebush@mac.com. My husband, Dan Van Riper, took this photo of me outside the court house in Binghamton at the end of the Journey.